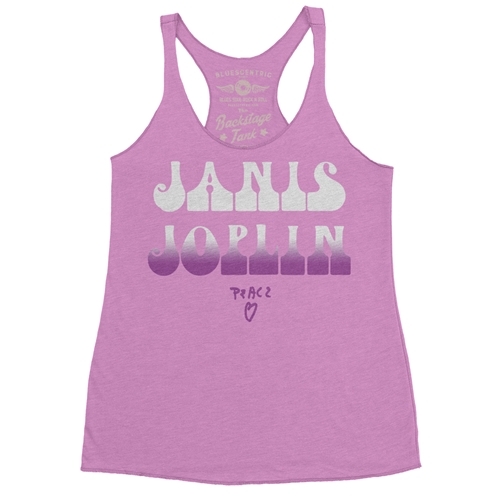 One unique thing about this official Janis Joplin t-shirt: The word "peace" and the heart were hand-drawn by Janis. She just wanted to sing the blues like her heroes; Bessie Smith, Billie Holliday, Big Mama Horton... But instead Janis Joplin's music came to define an era, and made her one of the most iconic musicians of the 20th century. The Bluescentric Brand Backstage Janis Joplin Racerback Tank is a premium Next Level brand fabric-laundered 4.2oz triblend 50/25/25 polyester/combed ringspun cotton/rayon racerback tee. 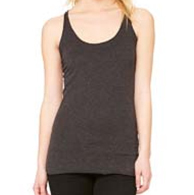 Sizes are available from XS-2XL.